Filling up empty wall space is hard, especially when you're on a budget. I like this smart and cheap decorating solution: paint a color block behind shelves or artwork that's too small, and your room is instantly more interesting. See more photos of the top room at BHG.com. The bottom room is by Vanessa De Vargas of Turquoise. So cute! I really need to fill up some wall space. Thanks, I love your blog! That is fantastic. A very clever and simple idea that looks great! That's really cool. Those color blocks make all the difference in the world! great idea! I was thinking of doing stripes on an entire wall (which I still love) but with our house being for sale...maybe not everyone digs stripes? BUT--this will give me some quick color and a change. Thank you! There's this huge wall space in my living room that has been begging for something large, and everything I could think of was way too expensive. What a wonderful idea! Such a simple idea, but it makes a bold statement, for sure! Love it, thanks for sharing! 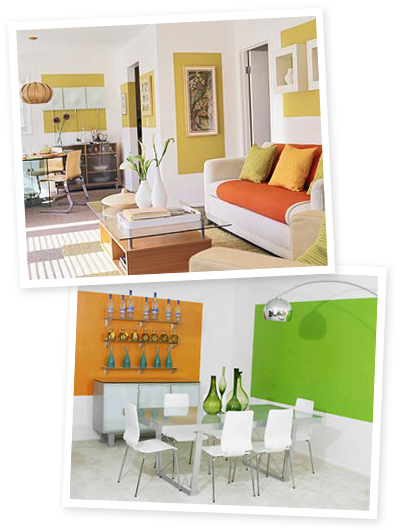 These pictures make me want to repaint my walls white so I can do the color blocks! I've thought of doing this around some of my pictures as a kind of frame around a frame for them....if I do it and it looks decent I will share. Great idea! I also find a color block with an arrangement of white canvases (just small white Dollar-store canvases, unpainted, and I like them square) in say three rows of three, looks so effective, is so cheap to do, and is a virtually effortless make-over! We have orange and turquoise colour blocks in our living room/dining room. Love them still, 6 years later. Wow - this is genius! Why didn't I think of that...! Thanks for sharing - this is a great idea for renters everywhere. Fan-say! It also seems like a good idea for people like myself that live in government (military) housing and the drab institutional white walls could use a little sprucing up! GREAT idea. I've been considering doing this behind a smaller photo to make it apprear larger! Nice colors. I love this decorating idea! Can't wait to try this out in my apartment. I love this idea! I have high ceilings and no access to a ladder. Problem solved! it's a room by Vanessa de Vargas, from Turquoise. Excellent! I don't remember how I ended up on Vanessa's site way back when--sure coulda been through your fab blog post--so thanks for the tip, Emily! Saw this earlier today and now I'm sitting next to my own "pebble drift" blue rectangle on the wall. I used it to block off a section with sixteen frames. I think it looks awesome. Wow, I applaud your initiative! Sounds great! I love the beautiful pictures of your home! Your decorating style is so delightful!